IDW Publishing has announced that the first issue of their new horror/comedy title, The Pound, is available to digitally download for free. You can access the comic through the IDW app on your iDevices, or you can grab a desktop version from Frozen Beach Studios here. San Diego, CA (April 27, 2011) – IDW Publishing and Frozen Beach Studios today announced the launch of the latest supernatural thriller comedy by Frozen Beach, entitled THE POUND. 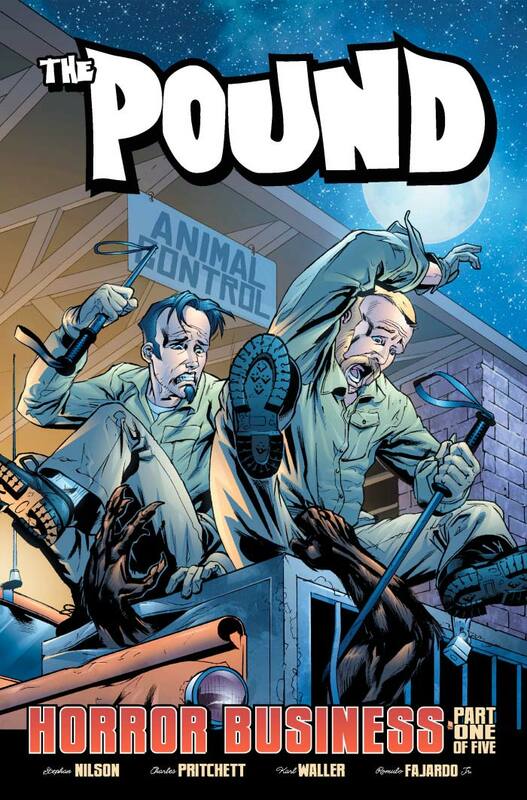 Created by Stephan Nilson and Charles Pritchett, THE POUND will be available digitally, and a collection of the entire five-issue series will be released in September 2011. To introduce readers to this exciting new series, THE POUND #1 is currently available for free through the IDW Comics iPad and iPhone app and will be available through the Sony Digital Comics store for PSP on June 1, 2011. The Pound follows two former Cleveland animal control specialists who have been laid off due to budget cuts. When they start up their own animal retrieval business, everything goes fine until they are called to the high school to capture a large dog that turns out to be a werewolf. Now the pair spend their days rehabilitating monsters that wish to return to normal society. Click the image below to blow sh!t up!